I'm just watching a documentary about the Berlin battle and I've come upon a piece of machinery I really wish to learn more about. Simply put, it seems to be, almost a plough that is towed by a locomotive. It anchors an arm into the ground and through the train tracks themselves. As the train moves forward, the arm drags behind completely destroying the track sleepers. Here's a quick picture I managed to get of the resulted damage. 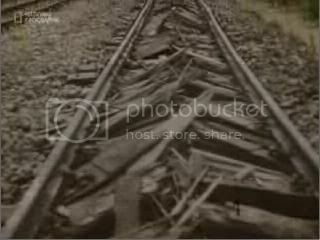 Afterwards, the Germans destroyed the remaining tracks with explosives. I'm wondering if this piece of machinery had a particular name or if there's any websites where I could learn more about it? Last edited by Shanghai on 21 Jun 2007 15:30, edited 2 times in total. Yep, and IIRC they were used as far back as the War of Southern Succession, aka the American Civil War. Somewhere, there is(are) a video(s) of a train track destroyer being used. It might be in the World at War Series, I can't recall. Might be the same footage. There have been several machines designed/built for destroying RR track besides plows pulled by a locomotive, the US made one post-war based on an M48 tank. Really destroying the track only buys a few days delay, as it can be quickly replaced if the materials are on hand. Clearing and laying the track bed is what takes most of the work to build/fix a RR and is almost impossible to effectively destroy except for bridges and tunnels of course. I put up some more pictures and the question which I, for some reason, failed to ask. It's such fun being side-tracked(pun?) all the time. But thanks for the information. I've just learnt of this item and never thought it could have been used much earler. Shanghai wrote: I'm wondering if this piece of machinery had a particular name or if there's any websites where I could learn more about it? The German names are Schienenwolf (rail wolf) or Schwellenpflug (sleepers plow). Thank you NagaSadow. It's the small pieces like this that help build up the bigger picture. 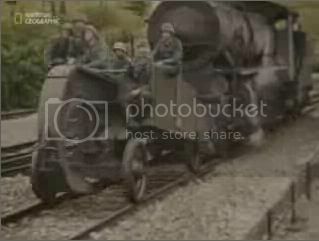 Yes there is some footage of this machine in world at war, in the episode on the genocide of the jews. It relates to the end of the war, when they were trying to erase evidence of what they had done. How do train drivers know when to start braking for a train station? I always wonder this when on a train. Trains take so long to slow down, sometimes a mile away from the station, how do they know the point to pick so they get into the station without over-shooting? Has anyone known a train to overshoot its station? What happens then, surely it cannot reverse! While I am no expert, I would say practice,,,power,,,coast,,,brakes. I was on the local mass transit railway (CTA) one time, and the driver was really flying. The first two cars overshot the elevated station. He quickly ran back and told the passengers they had to go thru these two cars into the others, then they manually opened the doors on the cars that were at the station. The CTA also uses numbered signs along the tracks, maybe to help guide them. Trains can reverse. However, I know the CTA (bus) drivers are strictly told NEVER to go reverse (on the street). I would presume the same held for the trains. A friend of mine was a train driver at one time, he was saying that they had all sorts of paper work to fill out re braking distance, for heavy trains, to establish a nominal stopping point. Sometimes they over or under shot, over= bad, under = ok. Here is a pic of a smaller version used for destroying roads. It is taken from a book about WW1 technical equipment. It was used by the imperial russian army while they've went back eastwarts in 1916/17.